Your life is busy and hectic, right? Your day is packed with herding kids out the door, packing lunches, drop-off lines, managing tantrums, and running that trumpet to the school. You’re constantly on the go and you need clothes that work with your busy lifestyle. I bet you’ve discovered that leggings are the best clothing choice for busy moms that were ever invented. Lularoe leggings feel amazing with their buttery-softness, but they’re pretty rough on your budget, right? They can also take up a lot of your precious time hunting for the perfect pair. Wouldn’t it be easier if you could just order some cute leggings and have them show up on your doorstep? Wouldn’t it be even better if they were cheap, just as comfortable, AND available in any size or color you wanted?! Well, I’ve got good news for you, beautiful Mama! There are some awesome leggings available on Amazon that are remarkably similar to Lularoe leggings for half the cost and they have Prime shipping. LuLaRoe (or LLR for short) is a multi-level marketing (MLM) company that sells soft, stretchy clothing including dresses, tops, and their famous “buttery soft” leggings. The leggings are often printed with bright, zany patterns. The clothes are soft, comfy, fun, and forgiving, and the leggings are generally priced around $25 (plus shipping if bought online). What is a legging-loving lady on a budget supposed to do? Find cheaper alternatives! 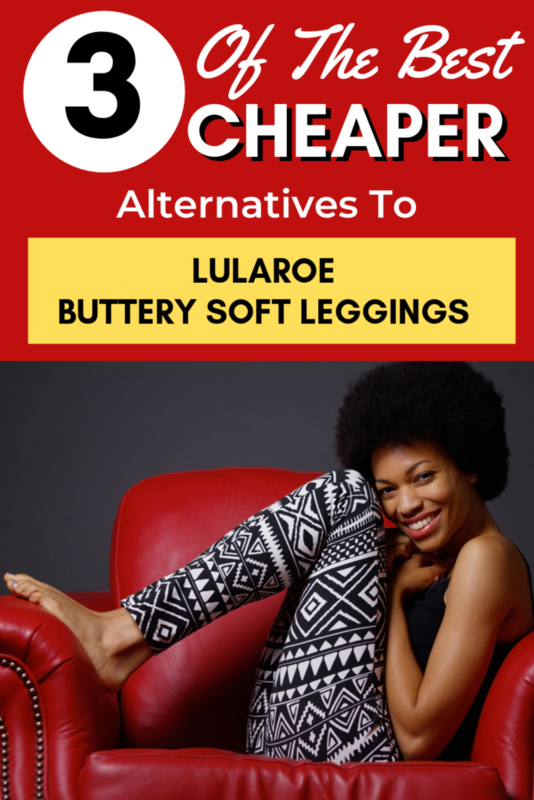 Some people might call them LuLaRoe knockoffs or LuLaRoe dupes, but LuLaRoe is not the only company that can make buttery-soft leggings! The most commonly mentioned alternative to LuLaRoe leggings is Viv Collection, available on Amazon. They come in regular size and plus size. Most reviewers say they’re just as good as LuLaRoe, and you can pick your print & size without having to search all over town. Returns are free and if you have Amazon Prime, you can get them in 2 days. And the price? Less than half of the cost of LuLaRoe! You know what the best part is? You can order PLAIN BLACK leggings in regular size or plus size without hunting all over town. Have you noticed how the LuLaRoe holiday-themed leggings are always so difficult to get your hands on? Well, there are other options that are much cheaper and easy to order! For an even great variety of colors and prints, Leggings Depot buttery soft leggings also get rave reviews! What about shirts? Tunic-style shirts are easy to find these days, but a lot of folks really like these tunics and they are also available in a 3-pack for even greater savings. This top is very similar to the Irma top from LLR for less than half the price! Have you tried any of these “LuLaRoe knockoffs”? I’d love to hear your thoughts in the comments below! Check out some of other cheaper alternatives posts. If you want more options for leggings, check out the post about Lululemon dupes. If you’re a savvy frugal fashionista, you may enjoy some other fashion-related posts like cheaper alternatives to Sperry boat shoes, cheaper alternatives to Rayban sunglasses, cheaper alternatives to L.L.Bean duck boots, and cheaper alternatives to Tieks and Rothy’s ballet flats. Also, if you’re considering becoming a LLR consultant, please check out the post about why joining an MLM will not solve your financial problems. I’ve never bought LLR, and I can’t say I will… I did try the VIV, and they were very soft! They ran a little small for me, and they did get a small hole relatively quickly. I am excited to try a pair of Land’s End leggings he I ordered on Cyber Monday for 50% off… they are very well reviewed, and Land’s End has a great guarantee! They would be more pricey than LLR without the discount, and they only come in black, but I’m not a jazzy-leggings kind of gal anyhow! I may have to try the Walmart leggings for a full comparison of the alternatives! Thanks for sharing your experiences! I’d love to hear how you like the Lands End or Walmart ones! I am a lover of the LLR leggings, though I’ve personally never paid full price at one of the parties or online. To be honest, I usually go to the online sites like Poshmark where you can find them gently used or even NWT for a huge discount. Having said that, I tried the Walmart brand so that I could see if maybe the hype was just that..hype. Well, the Walmart brand certainly felt the same way when I bought them. Maybe not AS buttery, but super close and for the price, close enough. The only complaint I have to make at all is the pilling. The Walmart brand pills quite a bit just from wear. I thought it was only fair to wash them inside out on gentle cycle and hang dry because that’s the same instructions that LLR leggings require, and I follow this regime strictly. The Walmart brand pilled in the thigh area and the bum area considerably more and much quicker than the LLR, but at that price point, you could afford to replace them and maybe get about the same life out of them. So, what I’ve learned is that if you’re looking for solids (or a short time wear holiday pattern), the Walmart is a great idea because it’s hard to find solids in LLR. Thanks so much for sharing your experience! That’s really helpful!